Synopsis: Popular Roman General, Maximus Decimus Meridius is betrayed by the elderly Emperor’s corrupt son, who seizes power for himself. Having lost everything, Maximus, becomes a gladiator, determined to get revenge. Review: Whenever you learnt about history, be it at school or university, odds are good that you would have learnt about the Romans and their considerable Empire. Their presence in history is certainly vast and indeed the impact they have on the world today equally so. As such, many film-makers have taken the task of representing the Roman Empire in film. 1959’s Ben-Hur or 1960’s Spartacus certainly come to mind, but no movie has arguably come quite as close as capturing Ancient Rome in all its glory quite as well as Ridley Scott in Gladiator. 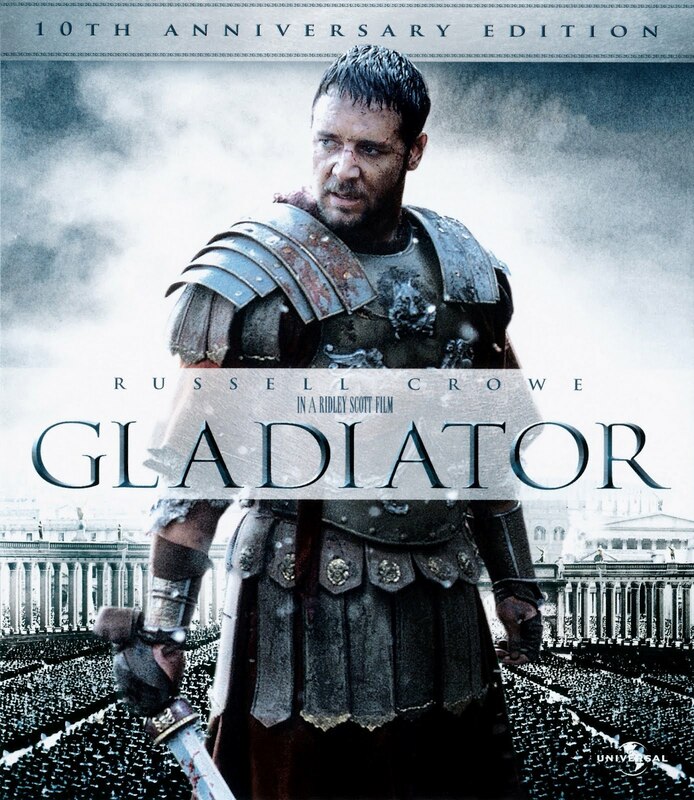 It is 180 AD and Maximus (Russell Crowe) is leading the Roman Army in a battle against the “barbarians” of Germania. All goes swimmingly and the general has the affection of the elderly emperor Marcus Aurelius. Unfortunately he does not share this love for his legitimate son Commodus, which does not end well for all parties. In committing his treason, the usurper must dispense with Maximus and his family. This plan goes somewhat awry but not before Maximus can save his family from a brutal fate. Furious with grief and anger over the murder of his Emperor and family, the fallen General sets out on a path of vengeance, against the corrupt Commodus, determined to bring justice on all those who wronged him. Scott is a director who made his name with science fiction, but he captures Ancient Rome in all its glory perfectly. Everything looks perfect right down to every detail. The costumes, the production design and sets all look exceptional, with extras aplenty, one can only imagine the sheer amount of work that must have gone into the detail. Of course there is CGI, being used for the Colusseum scenes, but the wow factor is not diminished in the slightest. The movie scooped the Oscar for Best Costume Design among others including Best Picture, and very well deserved ones at that, as well as nominations for art and set decoration. Of course the attention to detail would have been nothing without a compelling story, which we most certainly have courtesy of the screenplay by David Franzoni, John Logan and William Nicholson. The screenplay fuses perfectly the intense battle scenes with the behind the scenes political manoeuvring. From the very first battle onwards, the story is gripping, from a very climatic opening battle to some scenes with some very personal, emotional moments between these characters. Russell Crowe completely shone as the lead Maximus, he’s a loyal man, to his emperor and to his family, and a brilliant soldier. Strength and Honour are two words that absolutely define him. So when he becomes a gladiator, that compassion is gone, replaced by a ferocious hatred against those who committed horrific acts against those closest to him, but his honour remains absolute. Joaquin Phoenix is also on great form as the slimy, cold Commodus who has an alarming desire to sleep with his sister Lucilla (Connie Nielsen). The late Richard Harris as Marcus Aurelius and Oliver Reed as Proximo also both deliver excellent performances in what is an outstanding cast. There are more than a few superb action scenes packed into the movie’s run time. Scott helms these scenes excellently, and you have battles of all sorts, including a battle with chariots and in one instance, tigers. The action is edited superbly well and the scenes are completely gripping to watch from the scenes in a Roman Province right to the superbly recreated Gladitorial battles that take place in the Colessuem. Russell Crowe certainly showed his action chops in these scenes, and he delivered a career defining performance in this role, that won him a well deserved Oscar. In addition, with an immortal line of dialogue when faced against the treacherous Commodus will go down as one of the best lines of dialogue in any movie, ever, Maximus can certainly lay claim to being one of the best movie characters of the 2000s. A brilliant historical spectacle, fused with fictitious elements. Superb action and a career defining performance from Crowe, Gladiator can certainly lay claim to one of Scott’s best ever movies. Agreed! The musical score is fantastic. Oh jeez! How could I forget the score, Hans Zimmer you absolute legend!